Schedulers are responsible for initiating builds on builders. Some schedulers listen for changes from ChangeSources and generate build sets in response to these changes. Others generate build sets without changes, based on other events in the buildmaster. The schedulers configuration parameter gives a list of scheduler instances, each of which causes builds to be started on a particular set of Builders. The two basic scheduler classes you are likely to start with are SingleBranchScheduler and Periodic, but you can write a customized subclass to implement more complicated build scheduling. There are several common arguments for schedulers, although not all are available with all schedulers. Each Scheduler must have a unique name. This is used in status displays, and is also available in the build property scheduler. This is the set of builders which this scheduler should trigger, specified as a list of names (strings). This can also be an IRenderable object which will render to a list of builder names (or a list of IRenderable that will render to builder names). A reference to the BuildMaster object that owns this scheduler. This can be used to access the data API. The list of sourcestamps that triggered the scheduler. The list of changes associated with the sourcestamps. The list of modified files associated with the changes. Any property attached to the change(s) that triggered the scheduler will be combined and available when rendering builderNames . # check if the builder name matches it. # only schedule builders that have the specified tags. Specifies codebase definitions that are used when the scheduler processes data from more than one repository at the same time. The codebases parameter is only used to fill in missing details about a codebases when scheduling a build. For example, when a change to codebase A occurs, a scheduler must invent a sourcestamp for codebase B. Source steps that specify codebase B as their codebase will use the invented timestamp. The parameter does not act as a filter on incoming changes – use a change filter for that purpose. as a list of strings. This is the Simplest form, use it if no special overrides are needed. In this form, just the names of the codebases are listed. as a dictionary of dictionaries. In this form, the per-codebase overrides of repository, branch and revision can be specified. Each codebase definition dictionary is a dictionary with any of the keys: repository, branch, revision. The codebase definitions are combined in a dictionary keyed by the name of the codebase. A callable which takes one argument, a Change instance, and returns True if the change is worth building, and False if it is not. Unimportant Changes are accumulated until the build is triggered by an important change. The default value of None means that all Changes are important. The change filter that will determine which changes are recognized by this scheduler; Change Filters. Note that this is different from fileIsImportant: if the change filter filters out a Change, then it is completely ignored by the scheduler. If a Change is allowed by the change filter, but is deemed unimportant, then it will not cause builds to start, but will be remembered and shown in status displays. The default value of None does not filter any changes at all. A boolean that, when True, only adds important changes to the buildset as specified in the fileIsImportant callable. This means that unimportant changes are ignored the same way a change_filter filters changes. This defaults to False and only applies when fileIsImportant is given. A string that will be used as the reason for the triggered build. By default it lists the type and name of the scheduler triggering the build. The remaining subsections represent a catalog of the available scheduler types. All these schedulers are defined in modules under buildbot.schedulers, and the docstrings there are the best source of documentation on the arguments taken by each one. In a multi-master configuration, schedulers with the same name can be configured on multiple masters. Only one instance of the scheduler will be active. If that instance becomes inactive, due to its master being shut down or failing, then another instance will become active after a short delay. This provides resiliency in scheduler configurations, so that schedulers are not a single point of failure in a Buildbot infrastructure. The Data API and web UI display the master on which each scheduler is running. There is currently no mechanism to control which master’s scheduler instance becomes active. The behavior is nondeterministic, based on the timing of polling by inactive schedulers. The failover is non-revertive. the project string, as defined by the ChangeSource. the repository in which this change occurred. the branch on which this change occurred. Note that ‘trunk’ or ‘master’ is often denoted by None. the category, again as defined by the ChangeSource. The special argument filter_fn can be used to specify a function that is given the entire Change object, and returns a boolean. A Change passes the filter only if all arguments are satisfied. If no filter object is given to a scheduler, then all changes will be built (subject to any other restrictions the scheduler enforces). This is the original and still most popular scheduler class. It follows exactly one branch, and starts a configurable tree-stable-timer after each change on that branch. When the timer expires, it starts a build on some set of Builders. This scheduler accepts a fileIsImportant function which can be used to ignore some Changes if they do not affect any important files. If treeStableTimer is not set, then this scheduler starts a build for every Change that matches its change_filter and statsfies fileIsImportant. If treeStableTimer is set, then a build is triggered for each set of Changes which arrive within the configured time, and match the filters. The behavior of this scheduler is undefined, if treeStableTimer is set, and changes from multiple branches, repositories or codebases are accepted by the filter. The codebases argument will filter out codebases not specified there, but won’t filter based on the branches specified there. The scheduler will wait for this many seconds before starting the build. If new changes are made during this interval, the timer will be restarted, so really the build will be started after a change and then after this many seconds of inactivity. If treeStableTimer is None, then a separate build is started immediately for each Change. A list of categories of changes that this scheduler will respond to. If this is specified, then any non-matching changes are ignored. The scheduler will pay attention to this branch, ignoring Changes that occur on other branches. Setting branch equal to the special value of None means it should only pay attention to the default branch. None is a keyword, not a string, so write None and not "None". In this example, the two quick builders are triggered 60 seconds after the tree has been changed. The full builds do not run quite so quickly (they wait 5 minutes), so hopefully if the quick builds fail due to a missing file or really simple typo, the developer can discover and fix the problem before the full builds are started. Both schedulers only pay attention to the default branch: any changes on other branches are ignored. Each scheduler triggers a different set of Builders, referenced by name. However if you must use a fully qualified name, it is buildbot.schedulers.basic.SingleBranchScheduler. This scheduler uses a tree-stable-timer like the default one, but uses a separate timer for each branch. If treeStableTimer is not set, then this scheduler is indistinguishable from SingleBranchScheduler. If treeStableTimer is set, then a build is triggered for each set of Changes which arrive within the configured time, and match the filters. The scheduler will wait for this many seconds before starting the build. If new changes are made on the same branch during this interval, the timer will be restarted. Changes on branches not specified on this list will be ignored. It is common to wind up with one kind of build which should only be performed if the same source code was successfully handled by some other kind of build first. An example might be a packaging step: you might only want to produce .deb or RPM packages from a tree that was known to compile successfully and pass all unit tests. You could put the packaging step in the same Build as the compile and testing steps, but there might be other reasons to not do this (in particular you might have several Builders worth of compiles/tests, but only wish to do the packaging once). Another example is if you want to skip the full builds after a failing quick build of the same source code. Or, if one Build creates a product (like a compiled library) that is used by some other Builder, you’d want to make sure the consuming Build is run after the producing one. You can use dependencies to express this relationship to the Buildbot. There is a special kind of scheduler named Dependent that will watch an upstream scheduler for builds to complete successfully (on all of its Builders). Each time that happens, the same source code (i.e. the same SourceStamp) will be used to start a new set of builds, on a different set of Builders. This downstream scheduler doesn’t pay attention to Changes at all. It only pays attention to the upstream scheduler. If the build fails on any of the Builders in the upstream set, the downstream builds will not fire. Note that, for SourceStamps generated by a Dependent scheduler, the revision is None, meaning HEAD. If any changes are committed between the time the upstream scheduler begins its build and the time the dependent scheduler begins its build, then those changes will be included in the downstream build. See the Triggerable scheduler for a more flexible dependency mechanism that can avoid this problem. The upstream scheduler to watch. Note that this is an instance, not the name of the scheduler. upstream=tests, # <- no quotes! This simple scheduler just triggers a build every N seconds. This option only has effect when using multiple codebases. When True, it uses the last seen revision for each codebase that does not have a change. When False (the default), codebases without changes will use the revision from the codebases argument. If this is True, then builds will not be scheduled at the designated time unless the specified branch has seen an important change since the previous build. By default this setting is False. The time, in seconds, after which to start a build. The scheduler in this example just runs the full solaris build once per day. Note that this scheduler only lets you control the time between builds, not the absolute time-of-day of each Build, so this could easily wind up an evening or every afternoon scheduler depending upon when it was first activated. This is highly configurable periodic build scheduler, which triggers a build at particular times of day, week, month, or year. The configuration syntax is very similar to the well-known crontab format, in which you provide values for minute, hour, day, and month (some of which can be wildcards), and a build is triggered whenever the current time matches the given constraints. This can run a build every night, every morning, every weekend, alternate Thursdays, on your boss’s birthday, etc. If this is True, then builds will not be scheduled at the designated time unless the change filter has accepted an important change since the previous build. The default of this value is False. (deprecated; use change_filter and codebases) The branch to build when the time comes, and the branch to filter for if change_filter is not specified. Remember that a value of None here means the default branch, and will not match other branches! The minute of the hour on which to start the build. This defaults to 0, meaning an hourly build. The hour of the day on which to start the build, in 24-hour notation. This defaults to *, meaning every hour. The day of the month to start a build. This defaults to *, meaning every day. The month in which to start the build, with January = 1. This defaults to *, meaning every month. The day of the week to start a build, with Monday = 0. This defaults to *, meaning every day of the week. This scheduler allows developers to use the buildbot try command to trigger builds of code they have not yet committed. See try for complete details. Two implementations are available: Try_Jobdir and Try_Userpass. The former monitors a job directory, specified by the jobdir parameter, while the latter listens for PB connections on a specific port, and authenticates against userport. The buildmaster must have a scheduler instance in the config file’s schedulers list to receive try requests. This lets the administrator control who may initiate these trial builds, which branches are eligible for trial builds, and which Builders should be used for them. The scheduler has various means to accept build requests. All of them enforce more security than the usual buildmaster ports do. Any source code being built can be used to compromise the worker accounts, but in general that code must be checked out from the VC repository first, so only people with commit privileges can get control of the workers. The usual force-build control channels can waste worker time but do not allow arbitrary commands to be executed by people who don’t have those commit privileges. However, the source code patch that is provided with the trial build does not have to go through the VC system first, so it is important to make sure these builds cannot be abused by a non-committer to acquire as much control over the workers as a committer has. Ideally, only developers who have commit access to the VC repository would be able to start trial builds, but unfortunately the buildmaster does not, in general, have access to VC system’s user list. This approach creates a command queue directory, called the jobdir, in the buildmaster’s working directory. The buildmaster admin sets the ownership and permissions of this directory to only grant write access to the desired set of developers, all of whom must have accounts on the machine. The buildbot try command creates a special file containing the source stamp information and drops it in the jobdir, just like a standard maildir. When the buildmaster notices the new file, it unpacks the information inside and starts the builds. The config file entries used by ‘buildbot try’ either specify a local queuedir (for which write and mv are used) or a remote one (using scp and ssh). The advantage of this scheme is that it is quite secure, the disadvantage is that it requires fiddling outside the buildmaster config (to set the permissions on the jobdir correctly). If the buildmaster machine happens to also house the VC repository, then it can be fairly easy to keep the VC userlist in sync with the trial-build userlist. If they are on different machines, this will be much more of a hassle. It may also involve granting developer accounts on a machine that would not otherwise require them. To implement this, the worker invokes ssh -l username host buildbot tryserver ARGS, passing the patch contents over stdin. The arguments must include the inlet directory and the revision information. In this approach, each developer gets a username/password pair, which are all listed in the buildmaster’s configuration file. When the developer runs buildbot try, their machine connects to the buildmaster via PB and authenticates themselves using that username and password, then sends a PB command to start the trial build. The advantage of this scheme is that the entire configuration is performed inside the buildmaster’s config file. The disadvantages are that it is less secure (while the cred authentication system does not expose the password in plaintext over the wire, it does not offer most of the other security properties that SSH does). In addition, the buildmaster admin is responsible for maintaining the username/password list, adding and deleting entries as developers come and go. Note that you must create the jobdir before telling the buildmaster to use this configuration, otherwise you will get an error. Also remember that the buildmaster must be able to read and write to the jobdir as well. Be sure to watch the twistd.log file (Logfiles) as you start using the jobdir, to make sure the buildmaster is happy with it. Like most places in the buildbot, the port argument takes a strports specification. See twisted.application.strports for details. The Triggerable scheduler waits to be triggered by a Trigger step (see Triggering Schedulers) in another build. That step can optionally wait for the scheduler’s builds to complete. This provides two advantages over Dependent schedulers. First, the same scheduler can be triggered from multiple builds. Second, the ability to wait for Triggerable’s builds to complete provides a form of “subroutine call”, where one or more builds can “call” a scheduler to perform some work for them, perhaps on other workers. The Triggerable scheduler supports multiple codebases. The scheduler filters out all codebases from Trigger steps that are not configured in the scheduler. The NightlyTriggerable scheduler is a mix of the Nightly and Triggerable schedulers. This scheduler triggers builds at a particular time of day, week, or year, exactly as the Nightly scheduler. However, the source stamp set that is used that provided by the last Trigger step that targeted this scheduler. This class is only useful in conjunction with the Trigger step. Note that waitForFinish is ignored by Trigger steps targeting this scheduler. 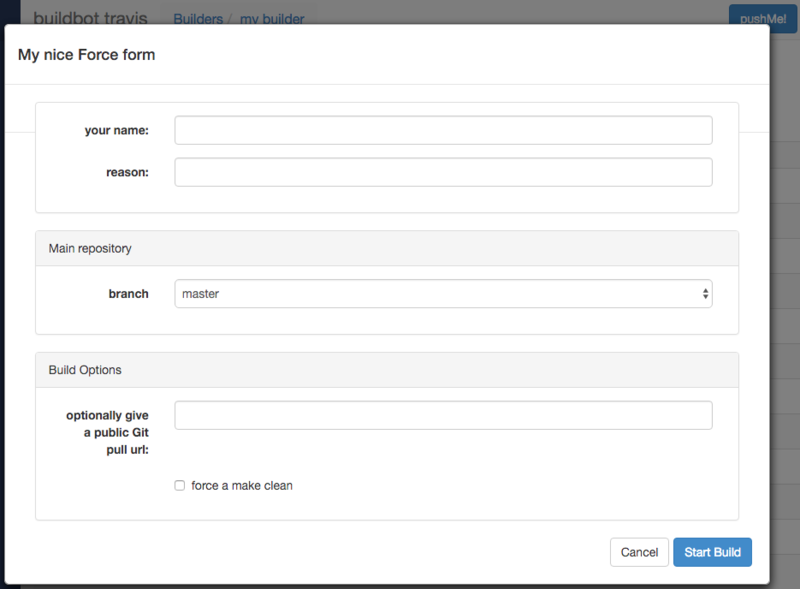 The ForceScheduler scheduler is the way you can configure a force build form in the web UI. In the /#/builders/:builderid web page, you will see, on the top right of the page, one button for each ForceScheduler scheduler that was configured for this builder. If you click on that button, a dialog will let you choose various parameters for requesting a new build. The Buildbot framework allows you to customize exactly how the build form looks, which builders have a force build form (it might not make sense to force build every builder), and who is allowed to force builds on which builders. How you do so is by configuring a ForceScheduler, and add it into the list schedulers. See name scheduler argument. Force buttons are ordered by this property in the UI (so you can prefix by 01, 02 etc in order to control precisely the order). List of builders where the force button should appear. See builderNames scheduler argument. A parameter allowing the user to specify the reason for the build. The default value is a string parameter with a default value “force build”. A string that will be used to create the build reason for the forced build. This string can contain the placeholders %(owner)s and %(reason)s, which represents the value typed into the reason field. A parameter specifying the username associated with the build (aka owner). The default value is a username parameter. A list of strings or CodebaseParameter specifying the codebases that should be presented. The default is a single codebase with no name (i.e. codebases=[‘’] ). A list of parameters, one for each property. These can be arbitrary parameters, where the parameter’s name is taken as the property name, or AnyPropertyParameter, which allows the web user to specify the property name. The default value is an empty list. The name of the “submit” button on the resulting force-build form. This defaults to the name of scheduler. Most of the arguments to ForceScheduler are “parameters”. Several classes of parameters are available, each describing a different kind of input from a force-build form. The name of the parameter. For properties, this will correspond to the name of the property that your parameter will set. The name is also used internally as the identifier for in the HTML form. The label of the parameter. This is what is displayed to the user. The label of the tab if this parameter is included into a tab layout NestedParameter. This is what is displayed to the user. The default value for the parameter, that is used if there is no user input. The maximum size of a field (in bytes). Buildbot will ensure the field sent by the user is not too large. If not None, autopopulate is a dictionary which describes how other parameters are updated if this one changes. This is useful for when you have lots of parameters, and defaults depends on e.g. the branch. This is implemented generically, and all parameters can update others. Beware of infinite loops! This parameter type is a special parameter which contains other parameters. This can be used to group a set of parameters together, and define the layout of your form. You can recursively include NestedParameter into NestedParameter, to build very complex UI. The layout defines how the fields are placed in the form. simple: fields are displayed one by one without alignment. They take the horizontal space that they need. tabs: Each field gets its own tab. This can be used to declare complex build forms which won’t fit into one screen. The children fields are usually other NestedParameters with vertical layout. The number of columns to use for a vertical layout. If omitted, it is set to 1 unless there are more than 3 visible child fields in which case it is set to 2. This parameter type will not be shown on the web form, and always generate a property with its default value. A string that will be compiled as a regex, and used to validate the input of this parameter. The width of the input field (in characters). The number of columns the textarea will have. This class could be subclassed in order to have more customization e.g. developer could send a shell script to amend the build. Beware of security issues anyway. This parameter type accepts an integer value using a text-entry box. This type represents a boolean value. It will be presented as a checkbox. This parameter type accepts a username. If authentication is active, it will use the authenticated user instead of displaying a text-entry box. If true, require a full email address rather than arbitrary text. This parameter type lets the user choose between several choices (e.g the list of branches you are supporting, or the test campaign to run). If multiple is false, then its result is a string - one of the choices. If multiple is true, then the result is a list of strings from the choices. Note that for some use cases, the choices need to be generated dynamically. This can be done via subclassing and overriding the ‘getChoices’ member function. An example of this is provided by the source for the InheritBuildParameter class. The list of available choices. If true, verify that the user’s input is from the list. Note that this only affects the validation of the form request; even if this argument is False, there is no HTML form component available to enter an arbitrary value. If true, then the user may select multiple choices. This is a parameter group to specify a sourcestamp for a given codebase. The name of the codebase. A parameter specifying the branch to build. The default value is a string parameter. A parameter specifying the revision to build. The default value is a string parameter. A parameter specifying the repository for the build. The default value is a string parameter. A parameter specifying the project for the build. The default value is a string parameter. A PatchParameter specifying that the user can upload a patch for this codebase. This parameter allows the user to upload a file to a build. The user can either write some text to a text area, or select a file from the browser. Note that the file is then stored inside a property, so a maxsize of 10 megabytes has been set. You can still override that maxsize if you wish. This parameter allows the user to specify a patch to be applied at the source step. The patch is stored within the sourcestamp, and associated to a codebase. That is why PatchParameter must be set inside a CodebaseParameter. InheritBuildParameter is not yet ported to data API, and cannot be used with buildbot nine yet(bug #3521). A function to find compatible builds in the build history. This function is given the master Status instance as first argument, and the current builder name as second argument, or None when forcing all builds. WorkerChoiceParameter is not yet ported to data API, and cannot be used with buildbot nine yet(bug #3521). This parameter allows a scheduler to require that a build is assigned to the chosen worker. The choice is assigned to the workername property for the build. The enforceChosenWorker functor must be assigned to the canStartBuild parameter for the Builder. This parameter type can only be used in properties, and allows the user to specify both the property name and value in the web form. This Parameter is here to reimplement old Buildbot behavior, and should be avoided. Stricter parameter name and type should be preferred.